Adam Lyth celebrates his ton. Picture by John Heald. Adam Lyth completed his first Specsavers County Championship century since last June during the morning session of a rain affected third day against Hampshire at Emerald Headingley. Opener Lyth, 30-years-old, reached 100 for the 23rd time in his first-class career as Yorkshire strengthened their grip on this penultimate round clash against a visiting side whose Division One safety was mathematically confirmed by Worcestershire’s defeat at Essex. The Whitby-born left-hander advanced from 60 overnight to 134 not out as Yorkshire, leading by 27 on first innings, moved from 172 for four to 287 for five. Yorkshire led by 314 when the rain arrived during the lunch break, and there was no more play possible. Heading into day four, Yorkshire still have a realistic chance of victory, as long as there is no more weather interruption. If they win, they will also, like Hampshire, be mathematically safe from relegation. Adam Lyth brings up his century. Picture by John Heald. But five points for the draw would leave them needing a maximum of just two points from next week’s final round clash with Worcester at New Road, so they would be satisfied with that outcome as well. 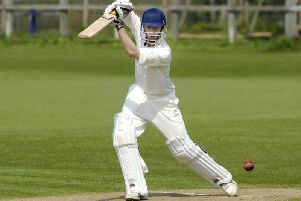 Former Scarborough Cricket Club man Lyth has endured a largely frustrating season, with only two half-centuries prior to this. He completed a fifth-wicket stand of 133 inside 42 overs with Jonny Tattersall, who added 43. Both men were dropped during the 33 overs bowled - Lyth twice. Lyth has hit 17 fours in his 209 balls so far, and he will be joined at the crease by Tim Bresnan on four at the start of the final day. “We’re in a very strong position, so we could do with the rain shifting," said Lyth. “Hopefully we can get out there and keep being positive. Then we can try and declare and have a go at them. “I’ve been on the wrong end of some pretty average decisions if I’m being honest, and it’s been a very frustrating season in red ball cricket. “I feel like I’ve been lining the ball up pretty well and getting no rewards. “You could probably see by my reaction when I ended up getting a hundred how pleased I was. “I’ve had a bit of luck in this game. I was dropped a couple of times today. But, beforehand, I hadn’t been getting it.